Philadelphia Interfaith Walk for Peace and Reconciliation. 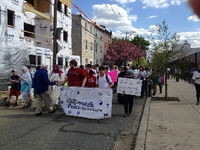 The Philadelphia Interfaith Walk for Peace and Reconciliation began when a group of Jews, Muslims and Christians came together in November 2003 to plan the first Philadelphia Interfaith Peace Walk for Jewish-Muslim Reconciliation that took place in May 2004 through the streets of Philadelphia. The Walk included stops for prayers, teachings, singing and fellowship at a mosque, synagogue, church and Independence Mall. Subsequent Peace Walks have taken place each spring from 2005 to the present—in various Philadelphia neighborhoods, including Center City, Northwest Philadelphia, West Philadelphia and Overbrook Hills. We invite people of all faiths to join us on a spiritual journey. As we walk from Al-Aqsa Mosque to St. Augustine’s Church to Congregation Rodeph Shalom, we will lament war and loss of life. We will pray for the safety and freedom of all people. We will embrace hope, not fear. The true pathway of peace is God’s desire for love and justice, not military might. Join with us to show that peace between people of all faiths is possible Let us call out Salaam. Let us call out Shalom. Let us call out Peace in the language of Love. This page was last edited on 16 December 2017, at 13:02.